Welcome to this rather sad post. Today I will not be talking about some book I read, a movie I watched, or even discuss the pros and cons of fan fiction. Today I'm here to talk about two brilliant men who died at 69. Both were British and both died due to cancer. I know I usually never write about famous people who died, but these two, they are dear to me, dear to my family, so I think it would be wrong of me not to write something. Let me start with David Bowie who died on Sunday, January 10th 2016, only two days after turning 69 due to cancer. He was a brilliant musician who changed the course of music history, was brave enough to embrace his weird side and show all of us that being weird, different then everybody else, is more then okay. He broke the rules of gender, appearing almost androgyne on stage, but he never looked silly, like a caricature, while doing so. 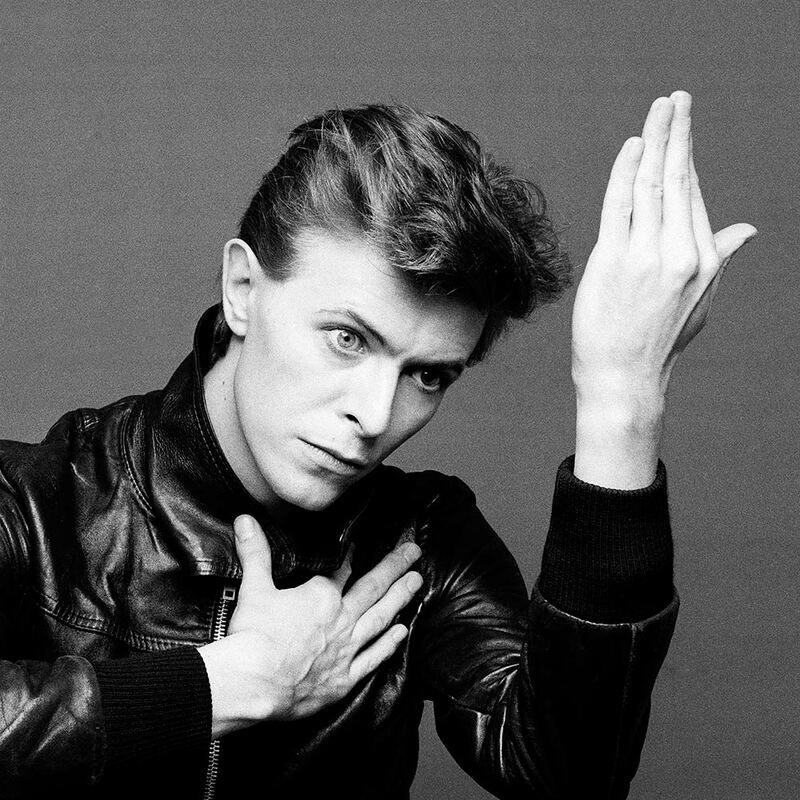 His music was outworldly, just like he himself, a Starman who didn't seem human. Personally, I've never considered myself a fan, rarely listened to his music, despite knowing many of his songs well, yet his passing had a big impact on me. David Bowie was before my time, yet I can see the value of everything he'd done and impact he had on everyone around me and on music. I come from a family of artists, my mother said that Bowie greatly influenced her, and her generation, that back in the times when Poland was hidden away behind the iron curtain, Bowie was the symbol of everything that waited on the other side, the crazy, colorful world that seemed so unreachable to everyone on else who wasn't on that side of the curtain. When news broke that he'd passed away, she told me she feels as if a loved person died, someone you know, even though you've never met them. Many people I follow on twitter said that it felt as if your first love died, your first celebrity crush. Two days ago I visited the street in Berlin where Bowie used to live and found myself amongst a smilier pictures to that we've seen from Brixton, London. People standing on the sidewalk, singing Bowie songs together, putting down flowers, pictures, messages and candles, honoring this man who did so much. 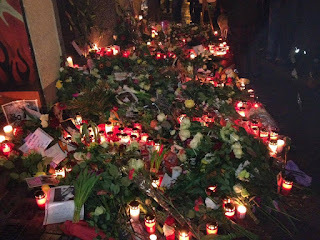 I found myself crying amongst them, touched by the impact he had on the people, surprised to find not only people my age, but also elderly ones bringing flowers or singing, sharing memories. I heard the people of Berlin started a petition to rename the street he'd lived on after him, which I think is a beautiful gesture which I hope will go through. Next I want to talk about the second man who died, the news came today: Alan Rickman died at 69 due to cancer. When I saw a post about this on Instagram, I swear I though someone was making a really dumb joke, I hoped it was just a joke, but once I went on google I realized that it wasn't a joke at all. I was shocked and speechless, I still am, tears pooling in my eyes. The first thought that came to my head was a quote he once said about Harry Potter about how, when he'll be eighty years old, he'll be sitting in his rocking chair reading the Harry Potter books even after all this time. Immediately I thought that now, unfortunately, it will never happen. As weird as it may sound, seeing as I belonged to the Harry Potter generation, the first memory of Alan Rickman I have isn't actually of him playing Snape, but Hans Gruber in Die Hard. It is one of my absolute favorite movies and he was perfect for the role. Then, of course, he was Snape, an iconic role that was written for him, as if it were his alter ego, natural and brilliant. I loved the way he played Snape, especially since Snape was one of my favorite characters along with Tom Felton as Draco, because I have a thing for the "villains". 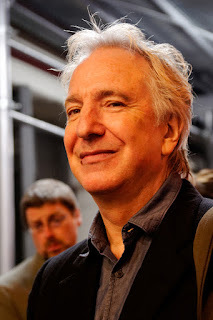 Alan Rickman has played many amazing roles in his life, was a outstanding actor and just seemed like a wonderful person, though I'm sad that I never got to meet him in person, like many others. We've lost a wonderful actor and someone who was part of so many childhoods. It is hard to believe that he is truly gone, and it saddens me even more since it is a sign that slowly other actors with whom we grew up will follow, a thought that brings tears to my eyes, our icons dying away, leaving our world. Before I will melt into a puddle I will end this post. I am deeply saddened by the loss of David Bowie and Alan Rickman. May they rest in peace!